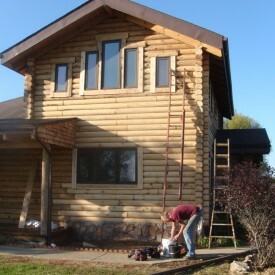 When it comes to log home restoration, 888-LOG-GUYS is the best around! We not only restore log homes, but we also repair log homes, chink and caulk log homes, improve log homes, and maintain log homes. Let us show you what a professional log home crew can do for you! Don’t rely on just anyone or an amateur to work on your log home! Don’t delay in having your log home serviced! Call us or ask for a consultation from our website! 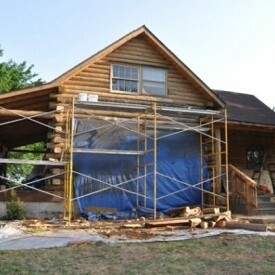 When it comes to restoring your log home, of course you want the best in the Osage Beach area! Look no further! 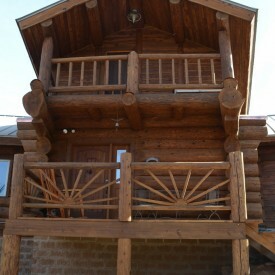 888-LOG-GUYS is exactly that, the best at log home restoration. Our process includes media blasting, sanding, a wash to sanitize, borate treatment, energy seal (chinking or caulking), and staining. What could have been a lot of work for you is expertly handled by our crew. Let us help you restore your home to look as good as new! Our company has many years and many feet of log repair experience! We know the concerns you might have once you discover a few of your logs are starting to rot. Or did you find carpenter ant or carpenter bee damage? Has your log home been hit with severe weather? You would like to keep or increase the value of your home and, more importantly, make sure your family has a safe and stable home. Let 888-LOG-GUYS take care of you! Call us or request a free estimate from our website! What a nuisance it is to deal with water leaks, air drafts, or pesky insects inside your log home! For log home owners, that may be a problem. 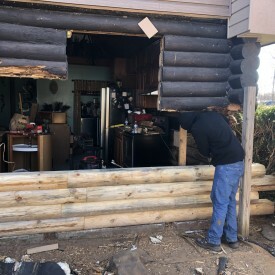 It is a good thing 888-LOG-GUYS is highly experienced in the area of log home chinking and caulking in the Osage Beach Missouri area. We can seal all the gaps in between your logs and get your log home air-tight to protect you and your family from nature’s elements. Contact us by phone or ask for a consultation from our website! Have you ever wondered what else you could build onto your log home? 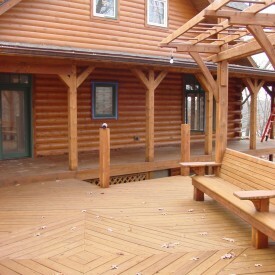 Our professional crews at 888-LOG-GUYS have experience building decks, porches, and patios. Our crews also have experience constructing and repairing log staircases. Our crews can also build or repair log railings for a staircase or a loft. If you have other ideas on what you would like added to your log home, then let us know! Our log home experts are waiting to discuss what we can do for you! 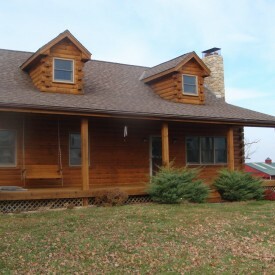 If you need advice on how to maintain your log home, then call 888-LOG-GUYS for the best solution for your log home in the Osage Beach MO area! We not only know the upkeep of log homes, but we can also provide you with top-notch log home maintenance service! Our crews know how to clean, re-stain, and seal your logs to preserve your log home to perfection. And we will service your log home for your lifetime if you want us to!